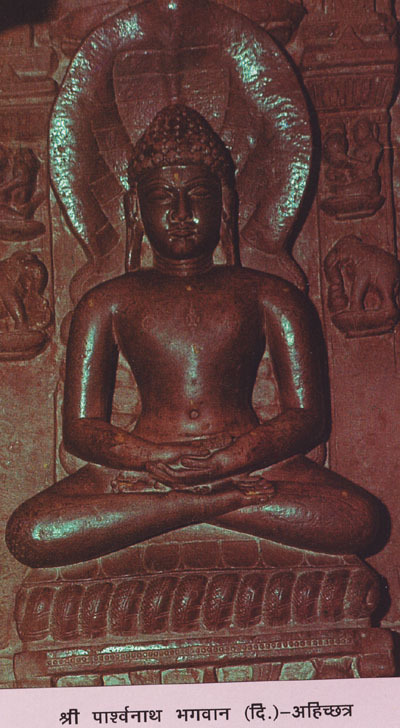 Shri Parshvanath Bhagwan seated in a lotus posture in a shrine near the village of Ramnagar Killa Dig). Once upon a time, this was a very prosperous city. Its area circumference was 48 miles and it had within its borders several temples, residential large and small houses, market places, streets, gardens etc., the present villages of Amvala, Vajirganj,Sampani etc., were parts of this city. During the period of Mahabharat, the city was the capital of Sri Dronacharya. Just before Bhagwan Parshvanath’s period, the city was the capital of Naga Kings and was a great centre of Jain religion. It was here that when Bhagwan Parshvanath during his wanderings as a monk was seated in deep meditation, Meghamali (Karnath) had attempted to create the most adverse conditions of harrasement to him. In “ Kuvalayamala” composed by Acharya Sri Udyotansurishvarji, it is described that Raja Harigupta of Gupta dynasty in the 6th Vikram Century took Diksha here. Kalikalsarvagna Sri Hemachandracharya referring to Ahichchatra has given to it another name of “Pratya Granth”. Acharya Sri Jinaprabhasurishvarji in 14th Vikram century in his compositon “Vividh Tirthkalpas” has stated that here, there were two temples of Bhagwan Sri Parshvanath and near the fort there was an idol of Goddess Sri AMbadevi, the Guardian Deity of Bhagwan Sri Neminath. He has further referred to a forest of medicinal trees and plants also in this area. This place, besides being a shrine for pilgrimage by several Tirthankars who succeeded Bhagwan Shri Adhinath has also been a place where 11 out of 12 Chakravartins have exercised their authority. The practive of intense penance by Bhagwan Sri Parshvanath in this place has an added significance. During the 8th century B.C. when he came into the forest here was engrossed inpenance, he was seated under a banayan tree. At that time one of the lesser gods named Meghamali alias Karnath who happened to pass by I sky riding in his space-ship, suddenly on seeing him, remembered the past scores which requitred settlement by revenge. He stopped a while andconjuring by his powers a very wild storm of dust and rains and snow created a very heavy down pour upon Bhagwan in great fury and a view to cruely harass him . Bhagwan however was not disturbed and continued to remain in deepest meditation. God Dharnendra and Goddess Padmavati (who in previous incarnation were male and female snakes respectively, saved from being scorched alive in burning fire and had attained to their present godhood state, on listening to the recitation of the Namokar Mantra by Sri Bhagwan Parshvanath) immediately came to his rescue and protected him from this harrassement by spreading their hoods over his head and entire body. Meghamali thereupon gor frightened and realized his misdeed. He instantly repented and fell at the feet of Bhagwan who, however had no ill-feeling aganst anyone andwas still in deep meditation. According to Digamber traditions, Bhagwan at that very moment attained Kewal Gnan. It is believed that this place started to be called “Ahichchatra” because God Dhanendra and Goddess Padmavati created a roof over the head and the body of Bhagwan seated in meditation by spreading their countless hoods here. Acharya Sri Patrakesari with his 500 disciples changed to Jain religion at this place. This temple is very ancient also. Mere sight of the idol gives one an experience of its antiquity. The idol is wonderful and attractive. It is extremely difficult to come across such anidol as this one anywhere else. The idols and objects found in excavations are lying well preserved in the Governmetn museum.The ruins of the old magnificient city spread over miles around can be seen. Many lovers of ancient monuments generally keep on visiting this area. From excavations many idols, stupas, pillars, etc., of the period of Kushan and Gupta dynasties have been found here as evidence of the antiquity of this shrine. There is a further possibility of obtaining important ancient material if appropriate excavations of old ruins spread out over miles around are carried out. An old idol of green color of Tikhalwala Baba here is worth seeing. It is believed that the walls of this Baba’s shrine were constructed in a single night by some invisible power. The place thus stated to be a placeof miracles. It is claimed that Baba fulfills all desires of his devotees. There is one well and one Vav here, water of which is used to cure illness of alldescriptions. Every year between Chaitra Krishna Ashtami and 13, a festival is held here when thousandsof people participate. Besides above, there is one more temple in this area. Nearby railway station of Amvala is 13Kms away, taxis andautos are available. This place issituated onAmvala-Shahabad road of Bareilly district. Bareilly is about 50Kms away from here. Cars and buses can go upto the temple. For lodging there is a dharamshala in the courtyard of the temple, with allfacilities and a bhojanshala is also available. Shri Ahichchatra Parshvanath Atishaya Tirthkshetra, Digamber Jain Mandir. Tel : 05823-36418 / 36618. Pachchakkhaan karane se kya laabh milata hai? पच्चक्खाण करने से क्या लाभ मिलता है? Bhaavi 24 Thirthankar abhi kahan hai ? भावी चोवीसी अभी कहाँ है ?